Have you seen these popular photos of Slovakia? Our daily updated database of photos with themes of Slovakia enlists more than 45452 photos related to The Slovak Republic in portfolios of many authors. We found that visitors who were interested in this large preview photography with title: Hiker enjoying the view., were also further interested in other pictures from our catalog. Here is a selection of 6 most popular photos from other authors available in our collection. 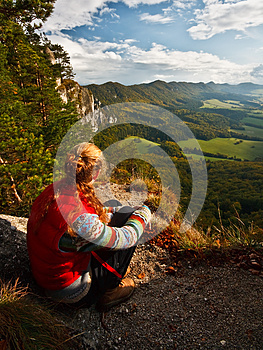 Our daily updated search engine found that this royalty-free stock photo with theme of Slovakia entitled: Hiker enjoying the view., is available at Dreamstime stock photo agency. We have detected that this stock photo is available in various resolutions, dimensions, licenses and file formats. The highest available dimension of this stock photo is as big as 2250 x 3000 pixels! If this stock photo was printed it would be as 19.1 x 25.4 centimeters (7.5 x 10 inches) big at size of 300 dpi. It is available in JPG file format as well as in additional TIFF file format. You can easily purchase and download this stock photo in the source agency. Hiker sitting on the edge of a cliff looking into a valley. This stock photo was photographed by Assignments and already had more than 100 downloads at the Dreamstime source agency which makes it extremely popular royalty-free stock photo with theme about Slovakia!